535 pages | 35 Color Illus. | 262 B/W Illus. Modern brachytherapy is one of the most important oncological treatment modalities requiring an integrated approach that utilizes new technologies, advanced clinical imaging facilities, and a thorough understanding of the radiobiological effects on different tissues, the principles of physics, dosimetry techniques and protocols, and clinical expertise. A complete overview of the field, Comprehensive Brachytherapy: Physical and Clinical Aspectsis a landmark publication, presenting a detailed account of the underlying physics, design, and implementation of the techniques, along with practical guidance for practitioners. "The editors, all very accomplished and extremely knowledgeable of the field, assembled a fine collection of authors to write on the widely varied topics. 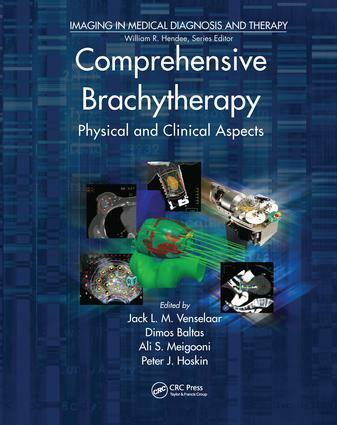 … a very good compilation on brachytherapy physics and the current state of the practice …"
"… an excellent reference text which represents the current status of brachytherapy for all clinical sites and sets the scene for how it will continue to progress. Readers will be particularly pleased to find discussions on margin concepts, radiobiology and 3- and 4-D imaging modalities for planning, as well as a thorough review of a range of modern techniques. … The amount of detail included is extensive … Excellent references are given throughout. … This will certainly be a key reference for today’s brachytherapy centres." "This book … addresses the topic of brachytherapy from many vantage points, oncological, physical, and biological, and will satisfy readers from the entire radiotherapy community." "Certainly, the frontier has been pushed in several directions and Comprehensive Brachytherapy covers some of these well… Overall, it is a very good compilation of brachytherapy physics and the current state of the practice…"
Historical Development of Predictive Dosimetry "Systems"